Andrew Mayne Stories cover art. 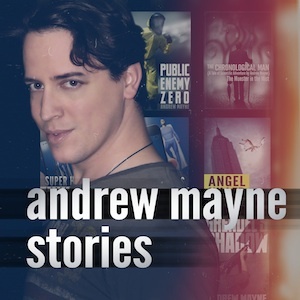 Andrew Mayne Stories is a podcast in which Justin Robert Young reads a short story written by Andrew Mayne, and Andrew offers insight into the stories and the happenings of his life. The first episode debuted on 13 April, 2012 as an audio podcast hosted on Andrewmayne.com. Episodes are released every Friday. Andrew details what is going on in his universe. Justin delivers a theatrical reading of a short story written by Andrew. Andrew provides backstory for the short story Justin read, and recounts the experiences that led to his writing it. Justin recorded his reading of Episode 1 live. Veronica is the only guest reader to date. The breakdowns aren't provided in episode write-ups due to their inherent spoilery nature. This page was last modified on 19 September 2013, at 22:35.